You could call it an election gift for Pakistan's new President. Or a threat. Just a day before Asif Ali Zardari, during his inauguration ceremony, swore to protect his country's sovereignty, a U.S. Predator drone launched five missiles at a suspected militant compound near the border with Afghanistan. The compound belonged to Jalaluddin Haqqani, one of the most notorious Afghan Taliban commanders based in Pakistan and a Soviet-era ally of the CIA. The Predator strike missed Haqqani, but it did kill four midlevel al-Qaeda operatives, government and militant sources told the Associated Press. It also killed as many as eight children, one of Haqqani's wives and a sister-in-law. Coming on the heels of two other American incursions  a commando raid on a suspected militant hideout on Sept. 3 left 20 people dead, and a Sept. 4 missile strike killed four more  the Haqqani strike roiled Pakistani public opinion. At his inaugural press conference, Zardari was pitched indignant queries about whether he would end U.S. raids on Pakistani soil. Each time, he punted, pointing out instead that Pakistan has a problem with terrorism but that "we can look the problem in the eye, and we can solve it." Punting may have been his only option: continued U.S. operations on Pakistani soil are inevitable; Admiral Mike Mullen, Chairman of the Joint Chiefs of Staff, on Wednesday called for a "new, more comprehensive military strategy for the region that covers both sides of that border." Pledging to stop U.S. raids would only undermine Zardari's credibility. The U.S. intelligence community believes that al-Qaeda has regrouped in Pakistan's ungoverned tribal territories abutting Afghanistan and that this area now serves as a staging ground for the movement's activities not only in Afghanistan but worldwide. The billions of dollars the U.S. has pumped into training and equipping the Pakistani military appears to have produced neither a capability nor a will to decisively tackle the problem. Many in Washington even suspect that members of Pakistan's Inter Services Intelligence spy agency are actively supporting Taliban and al-Qaeda leaders and may be tipping them off about planned attacks. So while U.S. strikes on Pakistani soil may be controversial, the theory goes, they are the only option for tackling a threat the Pakistani security forces are unable to neutralize. "The U.S. should make it openly clear that [it] cannot wait for Pakistan to [take decisive action] and will have to treat Pakistani territory as a combat zone if Pakistan does not act," wrote military scholar Anthony Cordesman of Washington's Center for Strategic and International Studies last month. "Pakistan cannot both claim sovereignty and allow hostile non-state actors to attack Afghanistan [and] U.S. and NATO/ISAF forces [there] from its soil." Predator attacks in Pakistan are hardly new. The first high-profile strike took place in January 2006, targeting al-Qaeda's deputy leader, Ayman al-Zawahiri, in the South Waziristan village of Damadola. The missile missed al-Zawahiri but killed dozens of villagers, unleashing violent protests across the country. 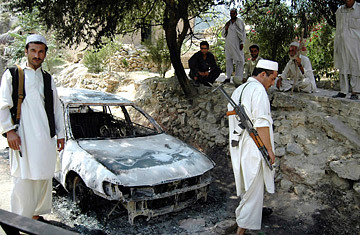 Similar attacks continued sporadically, becoming more frequent in early 2008 after negotiations on the issue between the U.S. and Pervez Musharraf. The U.S. also stopped warning the Pakistani military about attacks ahead of time, as had been customary, since too many militants, it seemed, knew what was coming. The stepped-up strikes began yielding more results. In January, al-Qaeda commander Abu Laith al-Libi was killed, along with a dozen purported militants. But a May attack in Damadola, said to be targeting Algerian al-Qaeda operative Abu Sulaymen Jazairi, killed more civilians, while a July strike in South Waziristan killed leading al-Qaeda bomb expert Abu Khabab al-Masri. Since then, at least five more U.S. attacks have occurred on Pakistani soil, and more are expected as the insurgency mounts against U.S. and NATO forces in Afghanistan. NATO Commander General David McKiernan has blamed Pakistan's inability to stop cross-border militancy for the 40% rise in attacks against U.S. forces in eastern Afghanistan along the border with Pakistan. As one U.S. Army officer bluntly put it, "We can't let these guys have safe havens." The new U.S. determination to pursue militants into their sanctuaries will not be limited to air strikes. The Sept. 3 commando raid was the first publicly acknowledged ground operation conducted by U.S. special-operation forces on Pakistani soil (even though U.S. officials refuse to comment on it). Clearly, a new, more intensive campaign has begun. The mounting Pakistani resentment over the civilian casualties inflicted in the U.S. raids  and Pakistani political leaders' ritual denunciation of those actions  are unlikely to change American plans. "They've gotten used to attacks being launched from drones," says a Pentagon official. "They might get used to this too." That may be wishful thinking. Pakistan's army chief, General Ashfaq Kayani, condemned the ground attack in a harshly worded statement released just hours after Mullen's statement, saying, "The sovereignty and territorial integrity of the country will be defended at all costs." He said there is no question of any agreement or understanding with the American-led Coalition in Afghanistan in which it is allowed to conduct operations on the Pakistani side of the border and that the current trust deficit between the two countries would lead only to more problems. Pakistani tolerance is diminishing for civilian casualties inflicted by a foreign army pursuing its own agenda. Clearly, the U.S. needs to hone its intelligence-gathering capabilities to do a better job of avoiding civilian casualties, while the Pakistani leadership  if it is to avoid becoming the target of a backlash  needs to question whether its best interests are served by being seen to impotently condemn every U.S. air strike aimed at a militant of al-Qaeda, rather than by seeking to convince its public that the targets of these raids are also enemies of Pakistan. Some former military leaders have already admitted the need for a fundamental change. "You cannot treat the two sides of the border as two different war zones," says Jehanzeb Raja, a retired brigadier who served in the tribal areas. "The Pakistan Army's aversion to any Predator or missile strike into Pakistan territory to kill the Taliban is tactically defeatist in essence, and strategically flawed in concept," he recently wrote in a local newspaper. "The Pakistan Army not only lacks any worthwhile real-time surveillance capability to pursue multiple targets in these remote regions, it also lacks the means to destroy these through long-range precision weapons." A Musharraf-era Pakistani official concurs, although the idea of U.S. soldiers fighting in Pakistan is so toxic that he asked that his name be withheld for fear of political repercussions. "Quite frankly, if Pakistan has the desire to carry out an action but doesn't have the capability, asking someone else to help makes sense," he said. Selling the idea to a Pakistani public already hostile to the U.S. war on terrorism, however, will be a lot more difficult. When asked how he would promote the idea, he just shrugged and smiled. With Musharraf out of the picture, selling Pakistanis on cooperation with the U.S. military is now someone else's problem. (See photos of Pakistan's lawless border regions here).